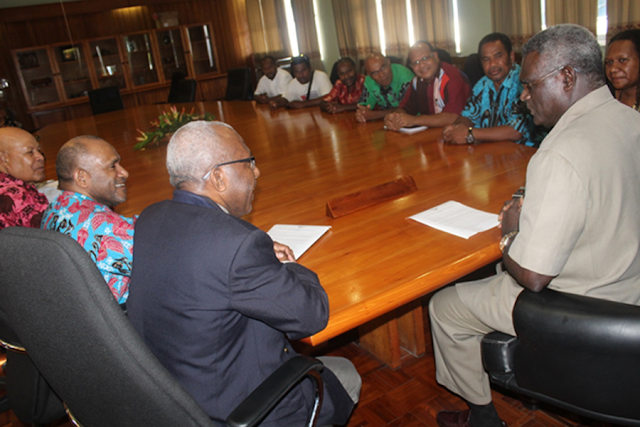 PM Sogavare, at the table head, meets the ULMWP delegation led by the ULMWP Secretary- General, Mr Mote. The Chair of the Melanesian Spearhead Group- Prime Minister Hon Manasseh Sogavare of Solomon Islands is considering the idea of getting the Indonesian Government and United Liberation Front Movement of West Papua (ULMWP) together for dialogue. He revealed this in Honiara this morning during an audience with a ULMWP delegation led by its General Secretary, Mr Octo Mote. The group requested the audience to update the MSG Chair about developments in West Papua following ULMWP’s admission into the MSG as an Observer and their campaign strategies for 2016 to 2019. Mr Mote told the MSG Chair that the ULMWP greatly appreciates his strong stand and commitment on the issue of West Papua. Prime Minister Sogavare acknowledged the ULMWP for updating him in his capacity as the MSG chair about the developments in West Papua, saying it is important that he is kept abreast of the happenings there. He also acknowledged the group’s appreciation for his strong advocacy for West Papua. He said he is aware that the Indonesian President is very cautious about his actions and approach towards West Papuans very lately, knowing too well that the world is closely watching him. The MSG Chair it is important that MSG engages Indonesia in its dialogue with the ULMWP on the issue of West Papua to gauge its thinking. “I have this idea of getting you- ULMWP and Indonesia- together to start dialogue and I will need your guidance. We would like to sponsor that. We will allow you to choose the agendas and talk face to face. Of course we’ll find some moderator to guide your discussions. “Whatever comes out of that dialogue will help us gauge the thinking of the Indonesian Government about the issues we are concerned about,” the MSG Chair said. Meanwhile, the MSG Chair welcomed the ULMWP’s announcement at the meeting that it has started work on establishing an office in West Papua. He said ULMWP’s presence in West Papua is strategically important. “It’s good to hear that you are establishing a secretariat office for your organisation in West Papua. Critics have raised their voices when the MSG accepted ULMWP as an Observer, saying that ULMWP consists of people living outside of West Papua and do not represent the people of West Papua.